Bridal Survival Tip : Wear In Your Shoes! Ah such a simple tip, one that is told many times and one we keep forgetting! There would be few things more uncomfortable on your wedding day than shoes that haven’t been worn in! Make sure that you wear your shoes around the hosue enough to be comfortable- stretch the leather and address any sore points on your feet with blister protectors, party feet or heel guards. Doing this ensures you will be the last one on the dance floor! Also make sure the sole of the shoe is slightly scuffed to give you some grip on those smooth church floors! Stay well hydrated with fruit juice or water during these warm summer days. Using alcohol as a drink for hydration purposes, just doesn’t cut it – you will just end up being thirstier. Lots of ice, a squeeze of lemon or lime, chunks of fruit in ice cubes, mint leaves all make fruit juice or water a little more festive. Try iced tea with fruit slices – yummy! Or a cold vegetable juice for those extra vitamins garnished with a celery stick. If it’s really hot, a few water ice pops will cool you down. 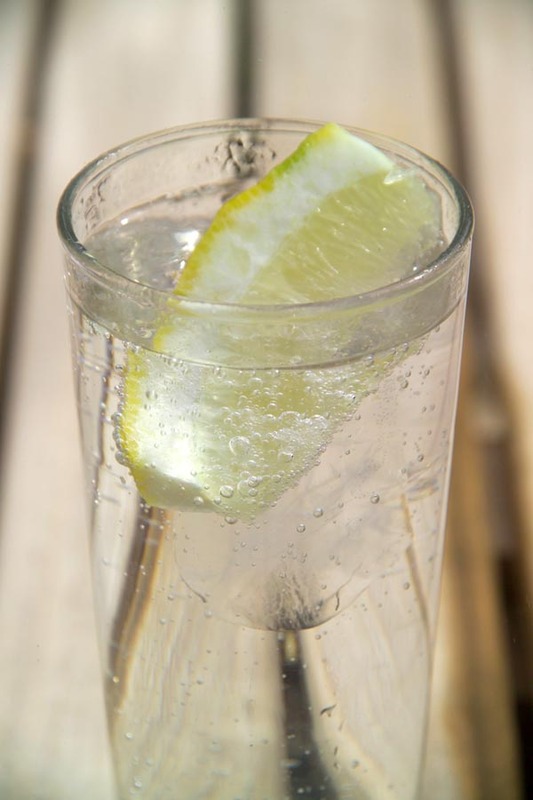 Or take a cool shower and slurp down a glass of cold water with a twist of lemon. Your skin and body will thank you! Roll Up Roll Up To the Circus Party! We were a little eager yesterday to get this entry up- so we posted our we love Wednesday early! When we said we loved the circus recently, we had a plan in mind! While this isn’t quite wedding related, with all the talk of beautiful parties around the blogosphere – we decided to share the party we recently threw for a 30th birthday in early November! We decided a 30th should be fun so chose the Roll Up Circus invitation from Alannah Rose Stationery. 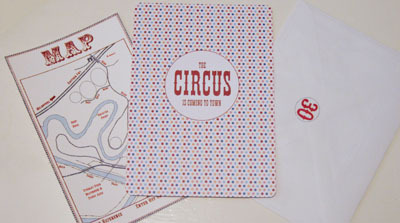 We found great circus fonts on the iDiY blog and created maps for guests and stickers for the back of the envelopes. We made bunting from cotton fabric (bought from Spotlight) in pale blue, royal blue and red fabrics alternating between checks and solids. Red, pale blue and dark blue balloons from Pink Frosting were tied with red and blue ribbon into big bunches and hung onto every point of the rotunda. We know adults like a few drinks! So we bought big plastic tubs in reds and blues from Bunnings and filled them with ice. 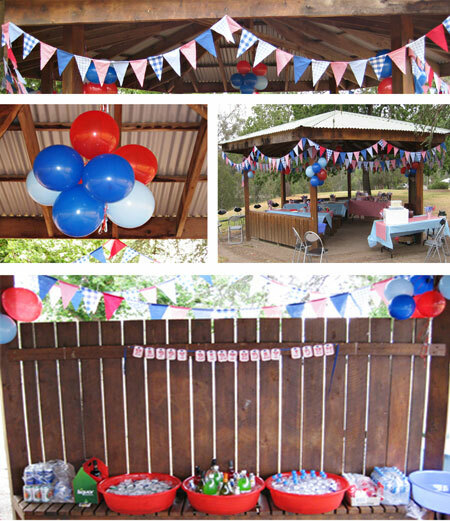 A circus themed birthday banner was designed by Charmed Beginnings on Etsy. Each table was dressed with a pale blue cover from Spotlight and red and white striped table runners from Details Details. We sat galvanised tin buckets full of smarties and blue foil covered mints on each table filled with pinwheels. On recommendation of Gigi & Lulu, we bought instructions, sticks, pins and beads from Pinwhirls and set about making masses of pinwheels using red, blue and white paper form our local scrapbooking shop. To make the paper double sided, we printed fun patterns of stars, stripes, polka dots, checks and circles onto the blank sides. We bought a few sets of juggling balls on ebay to keep guests entertained- we had a few amateur jugglers there on the day who were able to entertain the crowd with their skills! As a sweet treat, we made white chocolate chip cookies in the shape of stars and elephants (cutter bought from Bake It Pretty) and decorated them with brightly coloured smarties. Each guest was given a red foam nose or stick on false moustache bought from ebay to get into the spirit of the festivities. It’s certainly not a circus without popcorn, so we bought the good stuffed! Hot buttery popcorn was freshly popped from Flossy’s Fairy Floss, our popcorn boxes came from Bake It Pretty. Our favourite part of the day, was indeed, our lolly buffett! 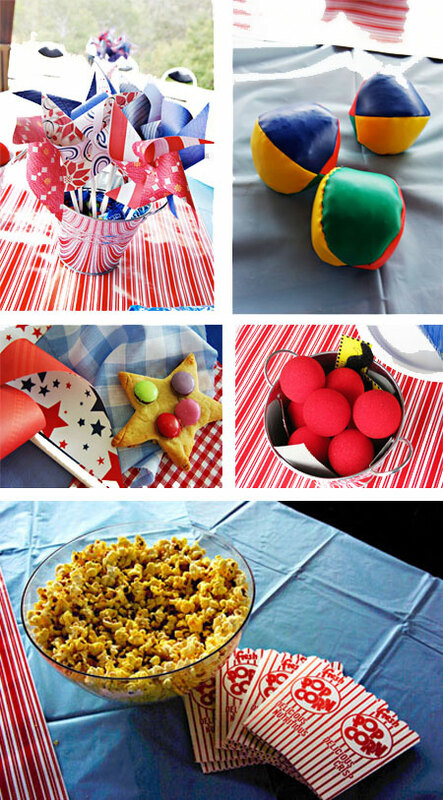 We laid a handmade red and white striped table cloth and packed the table full of circus treats! Freshly popped from Flossy’s Fairy Floss, filled popcorn boxes came from Bake It Pretty, galvanised tin buckets held single serves of white raspberry fairy floss from Flossy’s Fairy Floss, jam jars were filled with lollipops. We placed traditional red toffee apples from Toffee Apples onto white trays, red and white striped paper drinking straws from Bake It Pretty were a fun touch for guests drinks. White paper bags tied with red ribbon and the Roll Up Circus gift tags from Alannah Rose Stationery acted as guest’s gift bags to be filled with sweet treats. Handmade signs printed in red and blues invited guests to dig in! To top it off, the birthday boy’s favourite cake (chocolate of course!) took centre stage! Of course, being a wedding blog and all, we do hav to bring this back to Bridal Survival! So here are our survival tips for a stress free birthday party (especially helpful if you’re away from home like we were!). - Buy online! Except for our scrapbooking paper, the ice tubs, the party bags, lollies and a few things at Spotlight (table cloths, bunting etc) we bought everything online. As an online business, we’re obviously big supporters of online shopping but it also made everything so easy! We didn’t have to trek all over town to pick things up and everything came straight to our door! We could have bought even more online had we been more organised! - Book the venue! We knew the park we had chosen for the party was very popular for picnic gors and so we made the decision to book our rotunda. It did cost money but it was such a relief to know we had our venue and didn’t have to get there at 3am and camp out! We arrived on the day to a sign with the birthday boy’s name on it and the ease of knowing the venue was ours for the day. - Pack a box of essentials (we almost packed our bridal emergency kit but did resist!) including sticky tape, suncream, scissors, matches, string, tea twoels, garabage bags and anything else you think you might need. This was close by to us the entire time and came in handy endlessly! - Pack items in order of getting them out. We used our big plastic tubs for the drinks from Bunnings as storage for all of our party goods. We placed everything in order of how they needed to come out- table cloths were put on the top with table runners, while juggling balls were on the bottom. - Tablecloths make a colourful decoration abut are also wonderful for covering picnic tables which are often not the cleanest surfaces for eating off of. - Pre prepare as much as you can! We were lucky and had the popcorn pre popped, so all we really had to do was make salads, make our circus style cookies and chop onions. This saved us so much time! - Do A run through the week before. Obsessive much? Perhaps slightly! But when you’re taking a candy buffet to a park far away from your house, you have to be prepared! We set it up the week beforehand on the dining room table to check we had everything and what didn’t work. It helped us prepare things like stacking our popcorn boxes inside of each other (folding them out on the day would have taken a lot of time and they’re a little uneven when first folded) and allowed us to work out how we were going to place everything. This meant on the day everything went straight onto the table without much fluff. - Ice, ice & more ice! We bought ice the morning of the party go pull pre made salads out of the fridge and put them straight into eskys with ice. Once arriving at the venue, we went and got more ice for the drinks. Nothing like keeping something cold on a hot day! - Buy single serve drinks. We’re still sad our favourite coloured fizzy drink Izzie Soda isn’t sold in Australia! But we did make the decision to buy all of our drinks in single serves- it allows guests to choose what they wanted themselves without worrying about spillage or heavy bottles, eliminated the need for a lot of cups and meant we didn’t end up with 10 half finished bottles to store! Instead the left overs stay unopened, fizzy and will easily be consumed by us over the festive season! To make the drinks more festive, we used red and white paper straws from Bake It Pretty. - Be realistic! As much as perfectly iced cookies, cupcakes and unwrapped glistening toffee apples would have been wonderful on our buffet- had the temperature soared, it would have been one sticky mess! With no way of keeping the heat from our sweet treats, we chose plastic wrapped items that wouldn’t melt! - Limit breakables. This sounds really obvious but with a lolly table it isn’t! We used tin and plastic (easily found at Ikea, partyware stores, Bunnings or packaging places) to ensure there were no nasty breakages on the day. The best part is, all of it is reusable for future parties and is light and easy to store. - Don’t underestimate adults love of fun! We had a lot of fun with our guests- red noses, moustaches and juggling balls and even the pinwheels got a workout with guests creating fields of pinwheels around the rotunda. In true Bridal Survival style- we celebrated a 30th and survived! The day of the wedding, before you walk down the aisle can often be a tense experience. There are vendors delivering items, needing to be paid, needing directions and last minute emergencies to be dealt with. Ideally on your wedding day, a seasoned day of wedding coordinator will be able to manage the proceedings and save the newlyweds from any crises. Whether you have a coordinator or not, creating a contact list of all your vendors and making multiple copies is a great way of ensuring everyone’s details are at hand and you’re not left rummaging through your files at the last minute for your florist’s phone number. The list should contain the numbers of everyone in the bridal party, your immediate family and your vendors with the contact name. Print out multiple copies and ensure different people have a copy- your mother, your bridesmaid, the best man and even the reception hall. Letting everyone have details at their fingertips means there will be less pulling at you andwill give others the power to solve any problems.